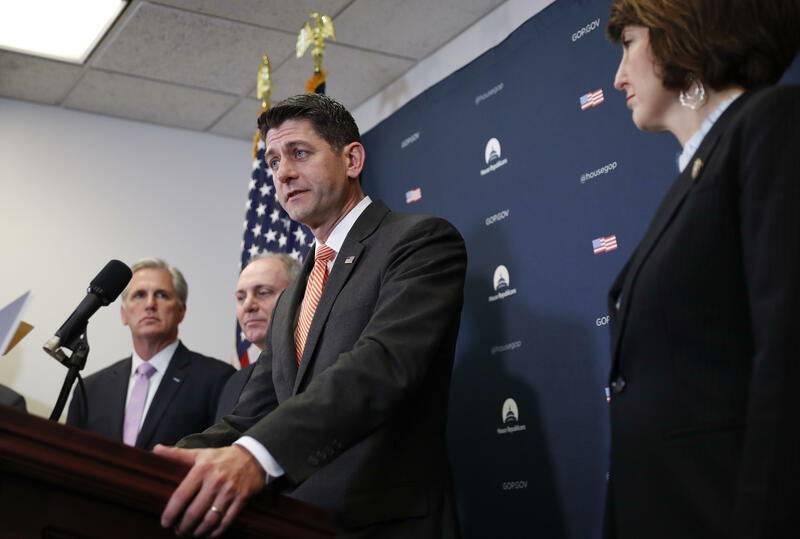 Republican leaders initially hadn't anticipated making any changes to the bill ahead of the vote which had been postponed until Friday. But when the conference emerged from the meeting, Rep. Jeff Denham, R-California, issued a statement on behalf of the bill's negotiators and said they would be adding more language dealing with agricultural worker visas and e-verify and rescheduling the vote for next week. "It gave our entire conference an opportunity to have a full discussion on these very important issues. While we've all been in negotiations the last several weeks, we feel like we've continued these good discussions on, but two new issues came up," Denham said. "We're going to spend the weekend, delay a vote until next week and see if we can come to a compromise on those two final issues." President Trump even got involved in the discussions at one point, calling up House Judiciary Chairman Bob Goodlatte, R-Virginia, just before the Republicans met. Goodlatte, who is a co-author of both the compromise immigration bill and the more conservative bill that was voted down earlier Thursday, opened up the meeting by passing on a message from the president: "Tell them I need the second immigration bill passed." While both bills were originated by Republicans, Goodlatte's bill was generally considered the more "conservative" one. The other bill, the "compromise" or "moderate" bill, was authored by GOP leadership. President Trump gave his support to both pieces of legislation. House Speaker Paul Ryan didn't seem certain that either bill would pass, but when he was asked Thursday what would happen if both immigration votes failed, he said only, "We'll cross that bridge if we get to it." If the compromise bill passes, it is likely to do so with solely Republican support. In a press conference on Thursday, Minority Leader Nancy Pelosi called the GOP compromise bill a "compromise with the devil." "It's not a compromise," Pelosi said. "It may be a compromise with the devil, but it's not a compromise with the Democrats in terms of what they have in their bill. Their bills are anti-family, perpetuate child detention, undermine existing protections, cut off many people who have been waiting lawfully to enter the country." Meanwhile, on Capitol Hill Thursday, a wave of protests against the Trump administration's "zero tolerance" policy broke out, with dozens of children, parents and religious leaders gathered in the Russell Rotunda to speak out against the separation of children from their parents. The children wrapped themselves in Mylar blankets and sat in the center of a large prayer circle, and clergy and parents prayed over them. Richard Morales, the director of Faith in Action's immigration campaign, also placed cages stuffed with Mylar blankets in the circle to symbolize migrant children held in facilities near the border. Morales said the blankets serve to represent "the children that have been separated and the children that will be separated by the 'zero tolerance' policy." Morales said that Mr. Trump's executive order Wednesday fell short. "What's going to the more than two thousand children that have been separated already?" Morales said. What's in the GOP compromise bill? On family separation: It would allow children to be detained with their parents, and mandate that DHS house families who are going through criminal proceedings for first-time border crossings rather than turn them over to the Justice Department, as is current policy, CBS News' Rebecca Kaplan reports. The compromise bill would also provide funding for detention centers. On DACA: It would allow those who qualified for DACA under the 2012 standards to apply for a six-year, indefinitely renewable legal status. They would also be able to apply for the merit-based visa program without going to their home countries first. Visas: The compromise bill would create a new, merit-based green card system with points for education, employment, English proficiency and military service by eliminating the diversity lottery and family visas for married children of U.S. citizens, and for siblings of adult U.S. citizens. It would also eliminate per-country caps for employment-based immigration. Border security: The compromise bill appropriates $25 billion in advance for border security funding for the wall, access and roads, and also includes the addition of a biometric entry-exist system. Overall immigration levels: The compromise bill would keep immigration bills level. CBS News' Rebecca Kaplan and Kristine Guillaume contributed to this report.